This article is about the British actor. For the American science educator, see Bill Nye. William Francis Nighy (/naɪ/; born 12 December 1949) is an English actor. He worked in theatre and television before his first cinema role in 1981, and made his name in television with The Men's Room in 1991, in which he played the womaniser Professor Mark Carleton. Nighy became widely known for his performance as Billy Mack in Love Actually. Other notable roles in cinema include his portrayal of Davy Jones in Pirates of the Caribbean film series, as well as Viktor in the Underworld film series. Nighy was born on 12 December 1949 in Caterham, Surrey. His mother, Catherine Josephine Nighy (née Whittaker), was a psychiatric nurse of Irish descent born in Glasgow, and his English father, Alfred Martin Nighy, managed a car garage after working in the family chimney sweeping business. Nighy was brought up as a Roman Catholic, and served as an altar boy. He has two older siblings, Martin and Anna. Nighy attended the John Fisher School, a Roman Catholic grammar school in Purley, where he was a member of the school theatre group. After leaving the school with two O-levels, he took a job as a messenger with The Croydon Advertiser. He entered the Guildford School of Acting to train for stage and film. After two seasons at the Everyman Theatre, Liverpool, Nighy made his London stage debut at the National Theatre in an epic staging of Ken Campbell and Chris Langham's Illuminatus!, which opened the new Cottesloe Theatre on 4 March 1977. He was cast to appear in two David Hare premieres, also at the National. During the 1980s, he appeared in several television productions, among them Hitler's SS: Portrait in Evil, alongside John Shea and Tony Randall. Nighy has starred in many radio and television dramas, notably the BBC serial The Men's Room (1991). He claimed that the serial, an Ann Oakley novel adapted by Laura Lamson, was the job which launched his career. More recently he has featured in the thriller State of Play (2003) and costume drama He Knew He Was Right (2004). He played Samwise Gamgee in the 1981 BBC Radio dramatisation of The Lord of the Rings (where he was credited as William Nighy), and appeared in the 1980s BBC Radio versions of Yes Minister episodes. He starred alongside Stephen Moore and Lesley Sharp in the acclaimed short radio drama Kerton's Story, written by James Woolf and first aired in 1996. He had a starring role in the 2002 return of Auf Wiedersehen, Pet, portraying crooked politician Jeffrey Grainger. He has also made a guest appearance in the BBC Radio 4 series Baldi. Two of Nighy's most acclaimed stage performances were in National Theatre productions. As Bernard Nightingale, an unscrupulous university don, in Tom Stoppard's Arcadia (1993), he engaged in witty exchanges with Felicity Kendal, who played the role of Hannah Jarvis, an author. He played a consultant psychiatrist in Joe Penhall's Blue/Orange (2000), for which he won an Olivier Award nomination for Best Actor, and which transferred to the West End at the Duchess Theatre the following year. In 1997, Nighy starred as Tom Sergeant, a restaurant entrepreneur, in David Hare's Skylight, which had premiered in 1995 and was moved to the Vaudeville Theatre. Nighy received some recognition by American audiences for his acclaimed portrayal of overaged rock star Ray Simms in the 1998 film Still Crazy. In 1999 he gained further prominence in the UK with the starring role in "The Photographer", an episode of the award-winning BBC-TV mockumentary comedy series People Like Us, playing Will Rushmore, a middle aged man who has abandoned his career and family in the deluded belief that he can achieve success as a commercial photographer. In 2003, Nighy played the role of the Vampire Elder Viktor in the American production Underworld. He returned in the same role in the sequel Underworld: Evolution in 2006, and again in the prequel Underworld: Rise of the Lycans in 2009. In February 2004, he was awarded the BAFTA Film Award for Best Supporting Actor for his role as Billy Mack in Love Actually. At the BAFTA Television Awards in April 2004, he won the Best Actor award for State of Play. He also appeared in the comedy Shaun of the Dead. In early 2004, The Sunday Times reported that Nighy was on the shortlist for the role of the Ninth Doctor in the 2005 revival of the BBC television series Doctor Who. Christopher Eccleston ultimately filled the role. In 2005, he appeared as Slartibartfast in the film adaptation of The Hitchhiker's Guide to the Galaxy. He also appeared in the one-off BBC One comedy-drama The Girl in the Café. In February 2006, he appeared in scriptwriter Stephen Poliakoff's one-off drama, Gideon's Daughter. Nighy played the lead character, Gideon, a successful events organiser who begins to lose touch with the world around him. This performance won him a Golden Globe Award for Best Actor in a Mini-series or TV Film in January 2007. Also in 2006, Nighy made his Broadway debut at the Music Box Theatre alongside Julianne Moore in The Vertical Hour, directed by Sam Mendes. In 2006, Nighy played the principal villain, Davy Jones, in Pirates of the Caribbean: Dead Man's Chest, although his face was entirely obscured by computer-generated makeup; he voiced the character with a Scots accent. He reprised the role in the 2007 sequel, Pirates of the Caribbean: At World's End, in which his real face was briefly revealed in one scene. He also provided the narration for the Animal Planet series Meerkat Manor. In 2006 he played the role of Richard Hart in Notes on a Scandal, for which he was nominated for a London Film Critics' Circle award. Nighy also appeared as General Friedrich Olbricht, one of the principal conspirators, in the 2008 film Valkyrie. He had played an SS officer in the 1985 Hitler's SS: Portrait in Evil. Nighy starred in the film Wild Target in 2010. In July 2009, he announced that he would play Rufus Scrimgeour in Harry Potter and the Deathly Hallows – Part 1. Nighy had already worked with director David Yates twice, and with the majority of the Harry Potter cast in previous films. He has said of his role as Rufus Scrimgeour that it meant he was no longer the only English actor not to be in Harry Potter. Nighy voiced Grandsanta in the 2011 CGI animated film Arthur Christmas. In 2012, he starred in The Best Exotic Marigold Hotel, Wrath of the Titans, and the remake of Total Recall. In 2013, he played a role in Darkside, Tom Stoppard's radio drama based on Pink Floyd's album The Dark Side of the Moon. In 2014 he starred with Carey Mulligan in a revival of David Hare's Skylight at Wyndham's Theatre in London's West End. It had a large international audience via broadcast in the National Theatre Live series. He and Mulligan also starred in the play when it was transferred to Broadway in 2015. Nighy had a 27-year-relationship with English actress Diana Quick, with whom he has a daughter, actress Mary Nighy. The couple separated amicably in 2008. He has Dupuytren's contracture, a hereditary condition which can, depending on the condition's severity, cause contractures of the fingers, most commonly the ring and little fingers. Nighy is a supporter of Crystal Palace and is the Patron of the CPSCC (Crystal Palace Children's Charity), and of the Ann Craft Trust. He is also one of the Honorary Patrons of the London children's charity Scene & Heard. Nighy is also a patron of the Milton Rooms, a new arts centre in Malton, North Yorkshire, along with Imelda Staunton, Jools Holland and Kathy Burke. Known for his support of total gender equality, Nighy noted in an interview during the 2016 DIFF film festival that the highlighting of the gender inequality problem had been a factor in his choice of films.. He has also spoken of his role in Pride, a film extolling the mutual support between the National Union of Miners and gay rights' groups in the UK in the 1980s, as one of most cherished..
Nighy is noted for his bespoke navy suits. He was listed as one of the 50 best-dressed over 50s by The Guardian in March 2013 and one of GQ's 50 best-dressed British men in 2015. ^ Williams, Steven (30 June 2006). "Acting Legend Bill Nighy Talks About The Pronunciation Of His Name". Contactmusic.com. Retrieved 10 February 2010. ^ Shaitly, Shahesta (4 July 2010). "Bill Nighy: Five things I know about style". The Observer. UK. Retrieved 7 October 2010. ^ Bill Nighy: the thinking woman's bagel Archived 1 October 2007 at the Wayback Machine The Independent, 19 February 2006; Family Detective The Daily Telegraph; accessed 21 March 2018. ^ Wills, Dominic. "Bill Nighy – Biography". TalkTalk. Retrieved 7 May 2010. ^ Blackhall, Sue (1 February 2010). Bill Nighy: The Unauthorised Biography. John Blake Publishing. ISBN 1-84454-867-8. ^ Bill Nighy, Hello magazine, undated, accessed 23 November 2009. ^ Schiff, Amanda (2 December 2008). "Laura Lamson Obituary". The Guardian. UK. Archived from the original on 5 December 2008. Retrieved 3 December 2008. ^ "Bill Nighy Is a Wild Target | Empire". Empire. Retrieved 11 March 2012. 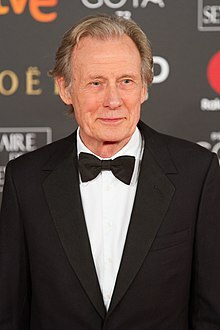 ^ a b "Bill Nighy to star in Harry Potter and the Deathly Hallows". BBC. 6 July 2009. Retrieved 6 July 2009. ^ "James McAvoy, Hugh Laurie, Jim Broadbent, Bill Nighy, Imelda Staunton and Ashley Jensen join the cast of "Arthur Christmas"". Archived from the original on 4 December 2011. Retrieved 23 November 2011. ^ a b "Pink Floyd album inspires Sir Tom Stoppard radio play". BBC. 28 March 2013. Retrieved 24 August 2013. ^ " 'Skylight' review – Hare revival is a Thatcherite play for today", The Observer, 22 June 2014. Retrieved 18 July 2014. ^ Roberts, Laura. "It's not Love Actually after all as star Nighy splits with partner of 27 years", Daily Mail, 25 August 2008. ^ "Ann Craft Trust: Safeguarding Disabled Children & Adults at Risk". Ann Craft Trust. Retrieved 14 March 2018. ^ "Scene & Heard – Who We Are". sceneandheard.org. 2010. Archived from the original on 10 February 2009. Retrieved 19 June 2010. ^ "The Milton Rooms homepage". Themiltonrooms.com. Retrieved 11 March 2012. ^ "In England at Christmas It's Me and the Queen", City Times (12 December 2016), accessed 25 March 2017. ^ "Bill Nighy has Never Been Prouder of his Career Choices than 'Pride'", Special Broadcasting Service (SBS) Australia online, interview (27 February 2019), accessed 3 March 2019. ^ Mansel Fletcher (15 November 2011). "The Look: Mr Bill Nighy". Mr. Porter. ^ "The Man With The Stolen Heart". Charlotte Film Festival. Archived from the original on 8 August 2012. Retrieved 9 August 2012. ^ "Great White Shark 3D". Retrieved 1 November 2013. ^ N'Duka, Amanda (30 January 2018). "Legendary's 'Detective Pikachu' Film Adds Bill Nighy & Chris Geere". deadline.com. Retrieved 14 March 2018. ^ Destiny – End Credits – IGN Video. IGN Video. 11 September 2014. Retrieved 4 December 2014. ^ National Theatre archive Archived 21 July 2013 at the Wayback Machine cast and production listing. ^ "BBC – A Charles Paris Mystery – ''Sicken and So Die''". BBC. 3 March 2008. Retrieved 11 March 2012. ^ "BBC – A Charles Paris Mystery – ''Murder Unprompted''". BBC. Retrieved 11 March 2012. ^ "BBC – Afternoon Play – ''I Wish to Apologise for My Part in the Apocalypse''". BBC. Retrieved 11 March 2012. ^ "BBC – A Charles Paris Mystery – ''Dead Side of the Mic''". BBC. Retrieved 11 March 2012. ^ "BBC – Saturday Play – ''Educating Rita''". BBC. 26 December 2009. Retrieved 11 March 2012. ^ "BBC – Saturday Play – ''Private Lives''". BBC. 2 January 2010. Retrieved 11 March 2012. ^ "BBC – A Charles Paris Mystery – ''Cast in Order of Disappearance''". BBC. Retrieved 11 March 2012. ^ "BBC – A Charles Paris Mystery – ''Murder in the Title''". BBC. 22 November 2010. Retrieved 11 March 2012. ^ "BBC – Afternoon Play – ''The Bat Man''". BBC. 20 April 2011. Retrieved 11 March 2012. ^ "BBC – A Charles Paris Mystery – ''A Decent Interval''". BBC. March 2016. ^ "BBC – A Charles Paris Mystery – ''Star Trap''". BBC. March 2019. Wikimedia Commons has media related to Bill Nighy.